Gerald Shapiro (August 1950 - October 2011) was an American writer who published three prize-winning books and was Cather Professor of English at the University of Nebraska. He was also a reader for Prairie Schooner. Shapiro received a B.A. and M.A. from the University of Kansas; an M.F.A. from the MFA Program for Poets & Writers at the University of Massachusetts Amherst. 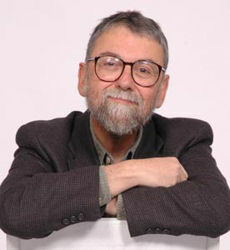 Shapiro lived in Lincoln, Nebraska with his wife, the writer, Judith Slater. He died October 15, 2011 of cardiac arrest. Shifman, the new arrival, lay there in his hospital bed, awaiting his dinner. He glanced tentatively across at his roommate, a sad-faced, middle-aged fellow named Weiner, whose bed was situated under a bank of wide windows. Aside from a moment of muttered hellos when he'd first arrived, the two of them hadn't spoken to each other at all. But now Weiner's gaze locked onto Shifman's, and he asked, "So, what you in for, young fella?" then fell into a fit of wet, explosive coughing. "Oh, they're going to do a little exploratory surgery on me," Shifman said. "I feel terrific, really. But I've got this little lump." He pulled down his shirt collar - he hadn't yet changed into the gown they'd provided him - but Weiner, still coughing, wasn't looking at him. "It's just a tiny lump," Shifman went on. "They're taking it out tomorrow morning and I'll be back at work by Thursday. I'm in advertising. Bowles and Humphries, downtain? It's right here, see?" He pointed to the base of his beck, off to the left side, just above his collar-bone. "I feel like I could play three sets of tennis. This is totally stupid, my having to be here. My doctor's neurotic." There were many geniuses at the Museum of the Mind, but Elliot Suskind wasn't one of them. Stuffed away in a cluttered windowless cubicle at the end of a dusty hall, he spent his days in quarantine, devising publicity events designed to call attention to the museum's exhibitions. His job consisted largely of recycling adjectives: breathtakingly innovative, he called the exhibitions in his press releases - radiant, blinding, ingenious, and so on. Meanwhile, up and down the corridors of brightly lit staff offices where the legitimate work of the museum was carrired out, brilliance hunt in the air as thick and fragrant as fog. Doug Escobar, for example, a neurobiologist who'd recently been awarded a MacArthur grant to support his work on spinal fliud: brilliant fellow. What a head on that guy! One door down from Escobar sat moody, preoccupied Arthur Wexler, a slump-shouldered physicist who'd brought in a grant from the National Science Foundation so large that no one knew its precise dimensions: again, brilliant.